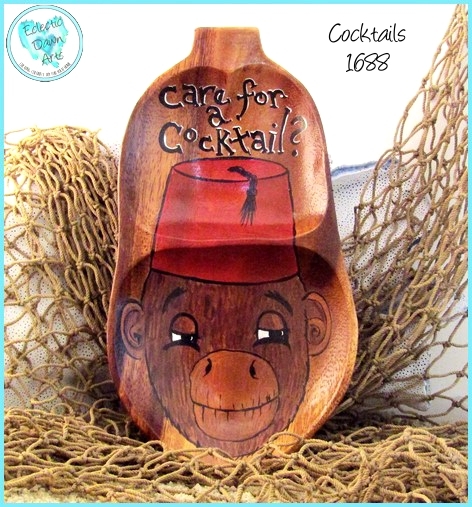 This funky tiki will liven up your tiki bar. 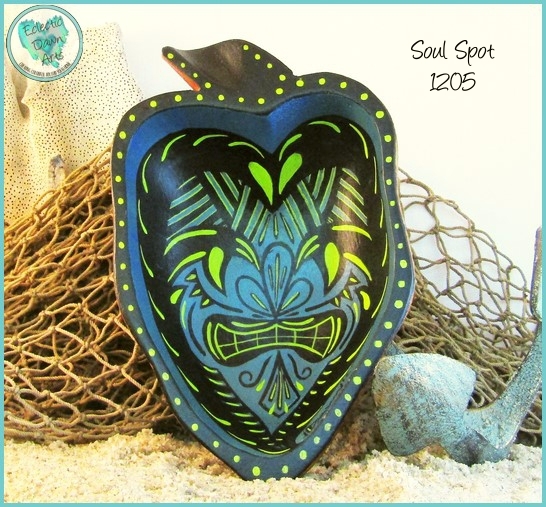 Approximately 8" x 5", this piece features a grimacing tiki in lime, black and dark teal blue, complete with a hip "soul spot". Free shipping! Not food safe, clean with damp cloth, do not put in dishwasher. 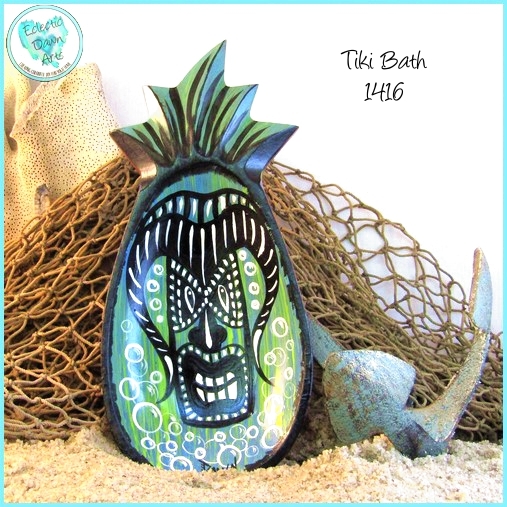 'Tiki Bath', approximately 8.75 x 4 inch (accessories not included), this funky hand-painted bowl art, done in green/blue, white, and black, is a very different visage of Ku, the god of war and strength. Everybody needs a bubble bath after a tough day at the office, including one of the strongest tiki! Free shipping. Not food safe, clean with damp cloth, do not put in dishwasher. 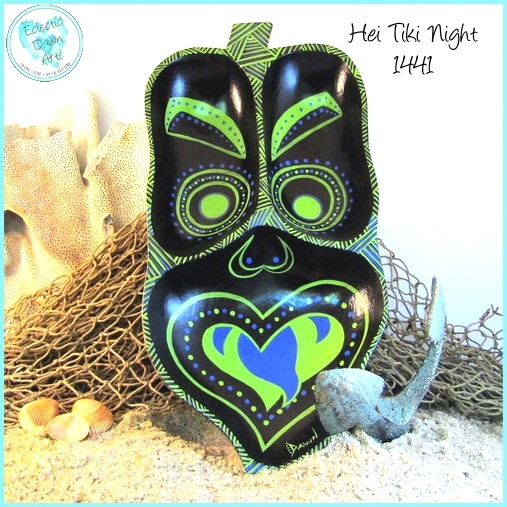 TB14-41 "Hei Tiki Night" Bowl (accessories not included) Approximately 12" x 6", this hand-painted bowl is shaped like a leaf, and re-imagined as a hei tiki (the first man), complete with tongue out in haka style. 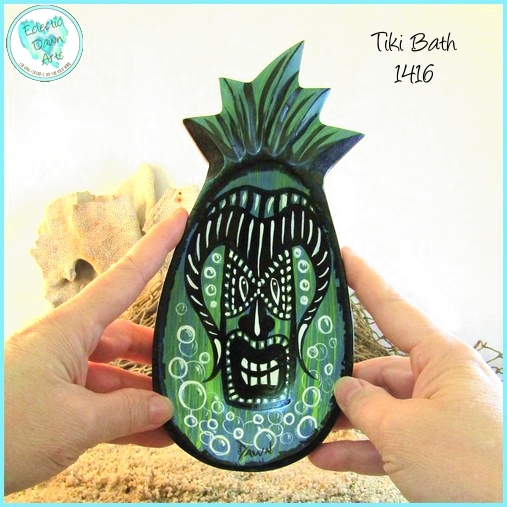 Imagine the conversations that this piece will spark; and you can share the legend of Hei Tiki with your friends while you sip drinks in your tiki bar! The lime and blue face details pop from a black background, with rhythmic dot designs around the eyes and intricate cross-hatching on the edge. Quite a personality! HEI TIKI was the first man (according to Maori legend), and hei tiki pendants are among Maori tāonga (treasured possessions). Interestingly, there is an author who has made comparisons to hei tiki and the Buddha because of the posture and pose, thinking the hei may be a debased memory of the Buddha. No matter where the original imagery came from, it remains a pervasive part of Maori culture today, and we've brought the image to you in a vibrant new style. Free shipping. NOT FOOD SAFE, clean with damp cloth, do not put in dishwasher. 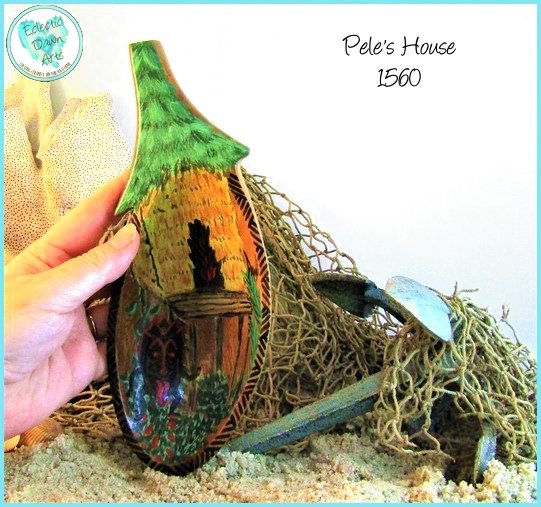 "Pele's House" (accessories not included) -TB1560 - 3.5" x 6" -- This hand painted shallow wood bowl has a fierce tiki (with tongue hanging out) protecting Pele's hut on a Hawaiian volcano. Madame Pele is the goddess of wind, fire, lightning, and of course, goddess of volcanoes, and the creator of the Hawaiian islands. 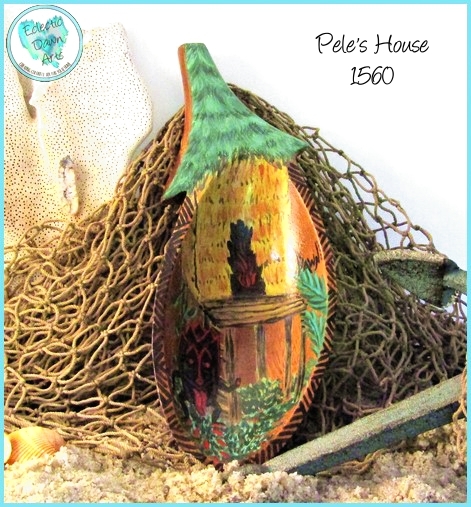 There are many versions of the story of how the Hawaiian islands were created, but Pele, along with her siblings, are the central figures in them all. Free shipping. NOT FOOD SAFE, clean with damp cloth, do not put in dishwasher. 'Cocktails' Trinket Tray TB1688 (accessories not included). ~8.25 x 4.5 inch (sizes are approximate). Fez monkey will be happy to watch over your rings, watch, coins, or keys for the night, or he'll be happy if you adore him as-is, too. 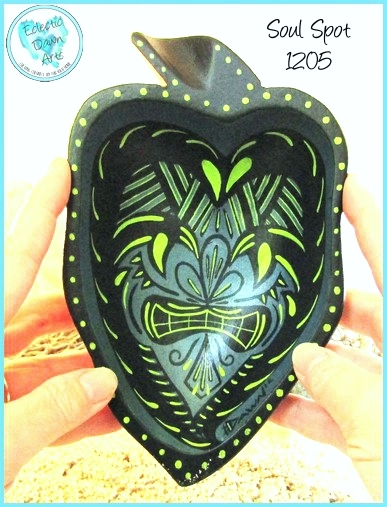 This shallow bowl (or tray) is a unique gift for a tiki bar lover, cocktail aficionado, or mid-century decor enthusiast. Free shipping. Not food safe, clean with damp cloth, do not put in dishwasher.